OK, so Boy and Girl are getting a little sick of the leftover potatoes, but this was the end of them. 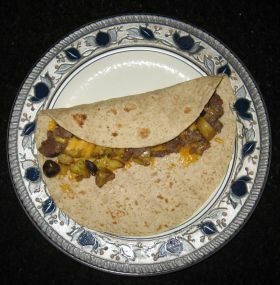 I took the leftover Garlic-Onion Home Fries, some browned, crumbled, low-fat breakfast sausage, some scrambled eggs and a little cheddar, stuffed it inside a whole wheat tortilla and there you have it….a Texas breakfast staple. A BIG hit with hubby (he doused them in Sriracha, as usual) and Girl, but Boy didn’t like the tortilla (it was a low-carb brand that I have to admit wasn’t very tasty – won’t be buying those again) and ate the filling out of his taco with a fork. The one in the photo is mine – I don’t like eggs in mine (just potato, sausage and cheese). OK, so I used Manwich canned sauce (tons of sodium and high fructose corn syrup) to make these, but Boy and Girl LOVE these. 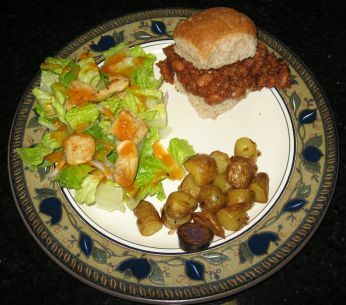 To make them a bit healthier, I used bison (VERY low fat) meat from my in-laws’ farm (my in-laws don’t raise them, but have an arrangement with the producer to re-sell it), added a can of organic pinto beans (drained and rinsed to get rid of the excess salt) and served them on mini whole wheat dinner rolls, to cut the portion size. Add a salad and it turns into something pretty healthy. Bison meat (same as buffalo, I think?) is really healthy, but we do find it to be a tad “gamey” to eat on it’s own. It’s OK, though, if it’s going in a tomato sauce or will be pretty heavily seasoned. Hubby made some great ravioli with it for Christmas Eve dinner, but I forgot to take a photo – DRAT! The potatoes were some of the leftover boiled fingerlings from Christmas dinner (before they got smashed, buttered, parsleyed and horseradish creme fraiched). I cut them into chunks, heated some olive oil in a pan over high heat, added the potatoes and cooked them on high, tossing/turning every few minutes, until they were crusty and browned all over. Then, I set the potatoes aside in the serving dish, added a tiny bit more oil to the pan and added 2 minced garlic cloves and about 1/4 cup finely chopped onion and sauteed those until soft, then added the potatoes back in (I was afraid that if I sauteed the onion and garlic with the potatoes, that they would get too brown and bitter before the potatoes were done). This dinner was a big hit with Boy and Girl! Cream Cheese-filled, Strawberry-filled, Original banana-filled. 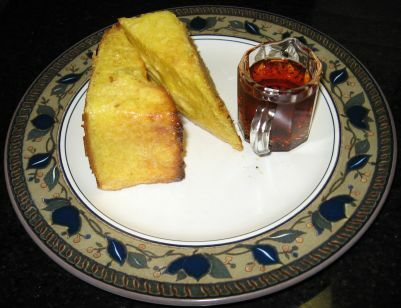 This French Toast was yummy, crusty, rich, sweet and flavorful. I tried two other fillings, in addition to the original banana, which is very good. Girl doesn’t care for bananas, so I made a strawberry paste by simmering and mashing some frozen strawberries with a little water until it was thick and pasty and used that to stuff the toast instead of the banana. That was very yummy. The other version was with sweetened cream cheese; I added a sprinkle or two of cinnamon and about 1 Tbsp of sugar to half a brick of lowfat cream cheese and used that in place of the banana. That one is my favorite. The great thing about this recipe is that a lot of it can be done in advance (making the creme anglaise) and that it bakes, so you don’t have to babysit and turn the French toast on a griddle while it’s cooking. 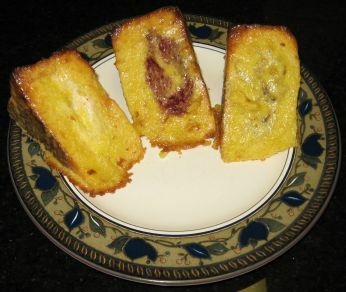 A Pullman pan is the culinary term for the long, rectangular (square when viewed from the “end”) loaf pans that bakeries use to make sandwich loaves in. Some Pullman pans have lids that slide over the top to keep the bread from rising so much, so that the baked bread will have a dense “crumb”. I did have to special-order the Pullman-pan brioche from my local grocery store, since they normally only make brioche rolls, and not loaves. If I looked around, I could probably find a store that makes it regularly, but, I just ordered it then cut the crusts off and cut it into 3-inch thick slices and froze it until I was ready to use it this morning and that worked fine. I do think that using brioche is worth it – it made it really light and flavorful. I cooked the creme anglaise a little too long, so it was really thick. I actually made a half-batch of the toast this morning, but made a full batch of the creme anglaise, thinking that I would put the leftover creme in the fridge to make it again another day soon, but because my creme turned out so thick, I actually used the whole batch of creme for a half-batch of bread. I found that it took longer than 12 minutes to bake, but that may have been because I over-soaked my toast in the double batch of thickened creme. This recipe was adapted from Brunch by Marc Meyer and Peter Meehan, but I saw it when it was published in the February 2006 issue of House Beautiful. I’ve looked for the recipe online, so that I could link it for you, but haven’t been able to find it. I don’t own the cookbook, but it looks like a really good one. The authors are the owners of the Five Points Restaurant in New York. Boy and Girl really loved this, as did Hubby. Prepare creme anglaise: Whisk together egg yolks, sugar, salt and vanilla in a pan. Whisk in 2 Tablespoons cream. Add remaining cream, whisking constantly. Cook, over medium low heat, stirring constantly, until sauce barely coats the back of a wooden spoon. Pour sauce into a shallow bowl and let cool. Prepare French toast: Preheat oven to 375 degrees. Lightly butter a sheet pan and place in oven. Cut bread into 8 3-inch-thick slices. Cut each slice diagonally into 2 triangles. Cut a slit into the wide side of the wedge, creating a pocket. Fill pockets with mashed banana. Dip stuffed bread slices into sauce, lightly coating each side. Place slices on preheated pan and bake until golden brown, about 12 minutes. Serve with maple syrup. Serves 8. 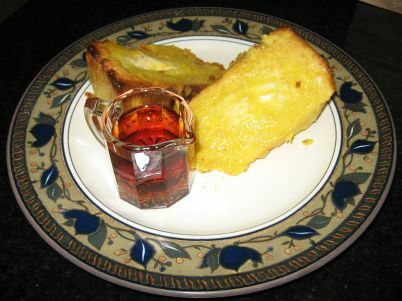 The photo that was in the article with the original recipe had the toast pictured like this, with 2 slices together, filling sides together, but I served them differently. I think that they must have baked the slices together that way, since their slices fit together that way better than mine, but I placed my slices on the baking sheet with the filling side up, so that side would toast and the filling wouldn’t be soggy. I also didn’t make any effort to “pair up” the bread slices that had originally been together before the bread was diagonally sliced. I think that the toast looks better served like this, with the slices angled up off the plate, filling sides up. My mother used to be an assistant district attorney in Beaumont, Texas. The county jail was in the same building, a few floors above. 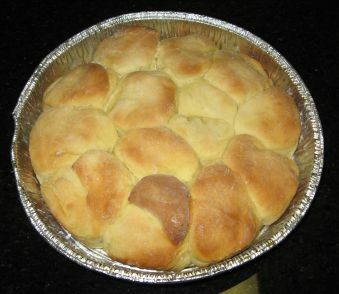 The jail cafeteria made these rolls regularly (at least when the grand jury was in session, I don’t think they made them for the prisoners), and they smelled so good while my mother was at work that she had to ask for the recipe. They are a holiday MUST for our family now. My mother and I used to make pans and pans of them to give as teacher gifts at Christmas and it would be unthinkable to have a meal with the extended family without them. My kids (and Hubby, and my dad) go CRAZY for them. They are rich, moist, yeasty and YUMMY. My mother insists that using margarine (instead of butter) and instant mashed potatoes (instead of “real” ones) provides a lighter texture. That does go against my real/slow/whole food philosophy, but I must admit that I wouldn’t change a thing about the way these rolls taste, so she must be right. Mix yeast in water; blend and set aside. Mix potatoes, eggs, margarine, sugar and salt. Add flour. Add yeast water. Mix. Place in a greased bowl and cover with a cool, damp cloth. Refrigerate for 2 hours. Remove from refrigerator. 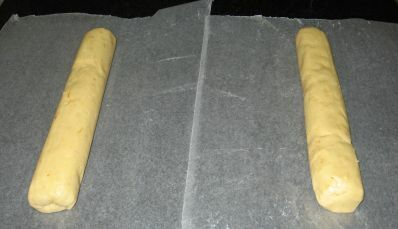 Roll dough out to about 3/4 inch thickness and cut with a biscuit cutter. Place in buttered pans (8″ round cake pans work well). Brush the tops with melted butter and let rise for several hours. Bake at 450 degrees for 10 – 15 minutes until lightly browned on top. Prepare dough as above. 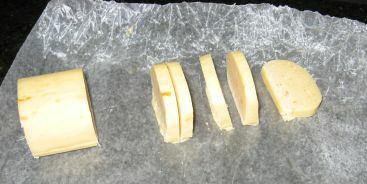 Divide dough in half after removing from the refrigerator. Roll each dough half into a large rectangle. Brush each rectangle with melted butter. Sprinkle each with a mixture of the sugar, brown sugar and cinnamon. Add chopped pecans and/or golden raisins to each rectangle, if desired. Roll rectangle into a log. Cut into 3/4 inch slices and place in a buttered pan. Let rise for several hours. Bake at 450 degrees for 15 minutes. Let rolls cool in pan. Mix together powdered sugar and butter in the food processor. Add vanilla and milk. Drizzle over cinnamon rolls and DEVOUR. This roast was SOOOO good. The Prime Rib recipe is available here. It’s worth a visit to Fine Cooking mag to get the back issue, though, for the potato recipe and lots of other great stuff (http://www.taunton.com/store/pages/backissue_fc.asp). That was a particularly good issue. 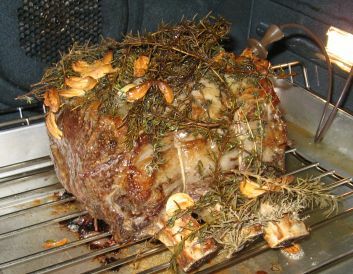 The “Roast Beast”, as we called it, in the oven. I would definitely recommend it and would make it again in a heartbeat. My only reservation was the cost of the meat. The roast that I used was a little over 6 pounds and cost $80!!! Prime Rib is so tender and juicy that it was definitely worth it, but I think that the flavor profiles of the herbs, garlic, etc. were so good that this recipe would definitely be worth trying with a “lesser” cut of meat for a more everyday meal. 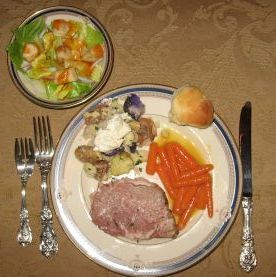 The horseradish cream from the potatoes was GREAT on the roast, too. Whisk together vinegar, garlic and pepper puree in a high-sided bowl. Whisk continuously while slowly pouring in olive oil. Salt and pepper generously – remember that each salad will only have a bit of the dressing, so will only have a bit of salt and pepper on it. This basic vinaigrette recipe can be adapted to almost any flavor combination. One of Girl’s favorite recipes is raspberry vinegar and a bit of raspberry coulis instead of the peppers (omit the garlic) to make a Raspberry Vinaigrette. Note: You may need a little more or less butter and seasoning, depending upon the size of your loaf of bread. Cut bread into bite-sized cubes (your choice, but I like them on the chunky side). Toss bread cubes with the butter in a large bowl. Sprinkle with the Baby Bam until each cube has a light coating of seasoning on it. Toss again until butter and seasoning are evenly distributed. Bake on an ungreased sheet pan until lightly crunchy and VERY lightly browned (20 – 30 minutes), gently stirring/tossing/turning about every 10 minutes. You will need to watch them carefully. Allow the croutons to cool before adding them to your salad. 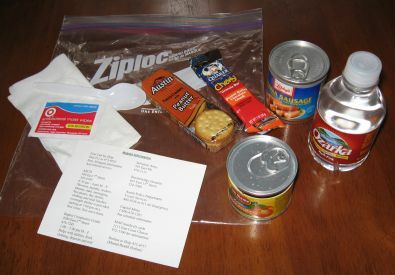 Store any leftovers in an airtight container or zipper bag. Steam carrots until tender but still slightly crisp; set aside. Mix juice, sugar and butter in a small saucepan. Cook over medium heat, whisking frequently, until it gently bubbles. Mix water with cornstarch until there are no lumps, then add to the juice mixture. Cook until thickened. Add ginger (or garlic). Pour over carrots. I took Hubby with me to my exercise class today. Apparently, it wore him out, because he came home and took a nap. 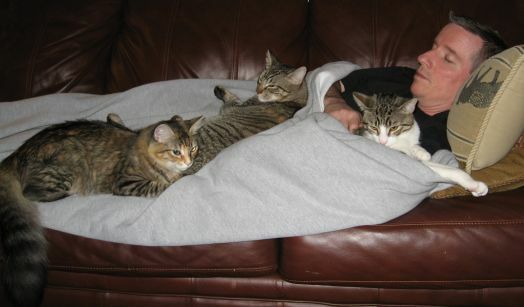 The cats (who are littermates) were THRILLED to have a snuggle buddy in the middle of the day and enthusiastically (err….well…..sluggishly) joined him in his lethargy. I apologize for this horrible photo – guess my camera skills were off tonight! Boil fingerling potatoes (the ones that I found were a mix of different potatoes, like Red Bliss and Blue and Baby Yukon Golds) until tender when poked with a fork (the recipe says use water, but I used chicken stock). Drain the liquid off – reserving a little bit of it. Smash each potato, individually, with a spatula or wooden spoon, just to smush it a little and break the skin. Put a little butter and chopped parsley on the potatoes after they’re smashed, using a little of the cooking liquid, if necessary. For the horseradish cream, blend 1 Tbsp. 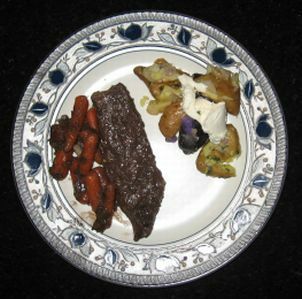 of prepared horseradish sauce with each 1/4 cup of creme fraiche that you would like to use. Top each serving of potatoes with a dollop of the creme fraiche. Little Brother made a WONDERFUL, rich, gooey Chocolate Bourbon Pecan Pie for dessert – I’ll have to get his recipe! This idea originally came from a community service project that Girl’s Girl Scout troop did a couple of years ago. I like this idea, because while we want to help those in need, it would be naive to ignore the fact that a lot of these people in need have substance abuse problems that giving them cash would enable them to pursue. This project, I believe, is a more suitable way to help. I am nervous about giving someone cash that they may use on booze or drugs, but I would never begrudge anyone food. This project was such a hit that we’ve adopted it and done it several times, as a family. I was worried, at first, that the intended recipients of these bags might be rude: “What do I want with this, Lady? Just give me money!”, but that was not the case at all. Every single person that we have given one of these to has responded graciously and gratefully. 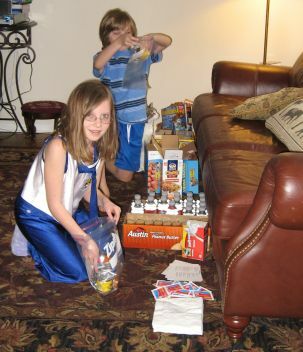 All of these items were packaged in a gallon-sized Ziploc bag. 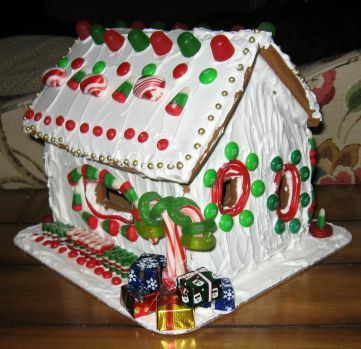 Photos of the Gingerbread Houses that Boy and Girl decorated. This is how we use up any leftover Halloween candy (and we bought a little more extra Christmas candy, too). The little foil gift boxes are specially wrapped chocolate “presents” that I found. Perfect. They had a lot of fun doing this. 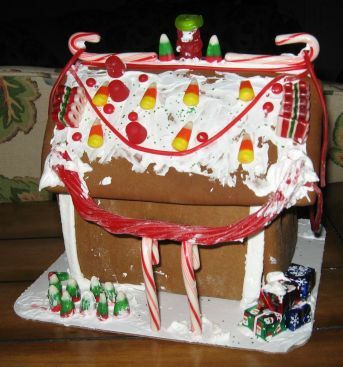 I can’t believe that I forgot to take photos of them actually decorating the houses – Bad Mom! My favorite desserts are ones that have fruit in them, especially citrus. I will bypass ANYTHING made of chocolate for a good, homemade lemon square or lemon meringue pie. I know that makes me a bit of an oddity amongst most chocolate-crazed females, but I am definitely partial to citrus. I will post my ALL TIME FAVORITE dessert sometime soon (Saucy individual Lemon Puddings – with a crunchy “brulee” topping). My best friend (I love you, Eileen!) made those for me for my birthday one year and I’ve never been happier! 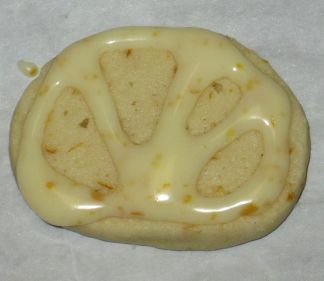 So, as unique and citrusy as these cookies are, they are a really nice change from all of the gingerbread and sugar cookies that are around at this time of year, or are a great cookie to round out the assortment on a cookie tray or in a cookie gift box. This recipe was torn out of a magazine that I found so many years ago that I don’t even remember which one it was. The copy of the page that I have is so torn up that I can’t even read the name anymore, so I will apologize now to whichever publication I am about to blatantly plagiarize. This recipe is SO good and the finished cookies are so pretty – these are a sure-fire winner. 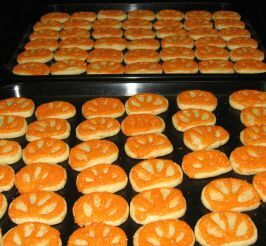 the powdered sugar in the dough gives them a nice, crispy texture, almost like a “sandie” cookie. I only make these at Christmas, so every year I have to go and hunt to find the recipe. I am thrilled that I will now (thanks to this blog) be able to effortlessly find the recipe every year from now on. 1. With mixer on medium speed, beat butter, sugar, orange peel, vanilla and baking powder until fluffly. Beat in egg. Reduce speed to low; gradually add flour, beating just until blended. 2. Divide dough in half. Shape each half into a 10-inch log. Press down on each log to flatten 1 side completely. Wrap and freeze at least 30 minutes, until firm enough to slice. 3. Heat oven to 325 degrees. 4. Cut 1 log at a time into forty 1/4 inch thick slices; place 1 inch apart on ungreased baking sheet (I usually line the sheets with parchment paper). 5. Bake for 11 to 13 minutes, until very lightly browned. (I find that these usually take the whole 13 minutes to be lightly browned on the bottoms, and sometimes more.) Remove to wire rack to cool completely. Repeat with remaining dough. 6. In medium bowl, whisk ingredients, until thick and smooth. Place in quart sized ziptop bag (or you may use a pastry bag with a small, round tip, like an Ateco #5). Pour colored sugar into a bowl. 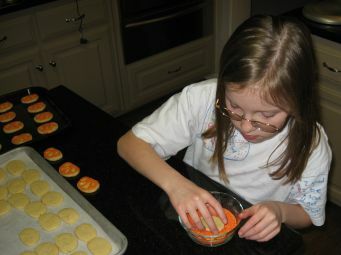 Snip tip off 1 corner of ziptop bag; pipe icing on cookies to resemble orange slices. Gently press cookies, icing side down, in colored sugar. Shake off excess.